Ok, ladies. Look at your arm. Does it make you think more of Xena or more of Gabrielle? 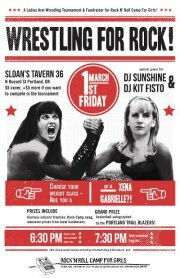 Whichever she-ro it might be, you have all week to prime it for the Women’s Arm Wrestling Tournament on March 1st at Sloan’s Tavern. The Xena class is for the big ‘n’ bad arms and the Garbrielle class is for the smaller ‘n’ kinda bad arms. Sign-ups start at 6:30pm. Throw-downs start at 7:30pm. 5 bucks to enter. Why all the arm wrestling and warrior princesses? It is a benefit for Portland’s Rock ‘n’ Roll Camp for Girls. Not sure if you want to participate yet? No worries….if you get there and fall under the sway of the competition, one buck allows you to challenge anyone in the room to a wrassle. What? You looked at your arm it is neither Xena or Gabrielle? Or you are not a lady? Then come on down and just have a great time. You can even enter the raffle to win Trailblazer stuff, She Bop stuff, tattoo and piercing stuff, and other stuff. This entry was posted in event, lesbian, music, nonprofit. Bookmark the permalink.